Pregnancy, birth and early childhood – how do we create the basis for the healthy development of the human being? This invitation is extended to all foundation years specialists: gynaecologists as well as midwives, neonatologists, paediatricians and general practitioners, nurses and teachers, psychotherapists and therapists, social workers as well as active representatives of parent associations. ­ ­ ­ ­ ­ ­ ­ ­ Program ­ ­ ­ ­ ­ ­ ­ ­ We look forward to the exchange of views. 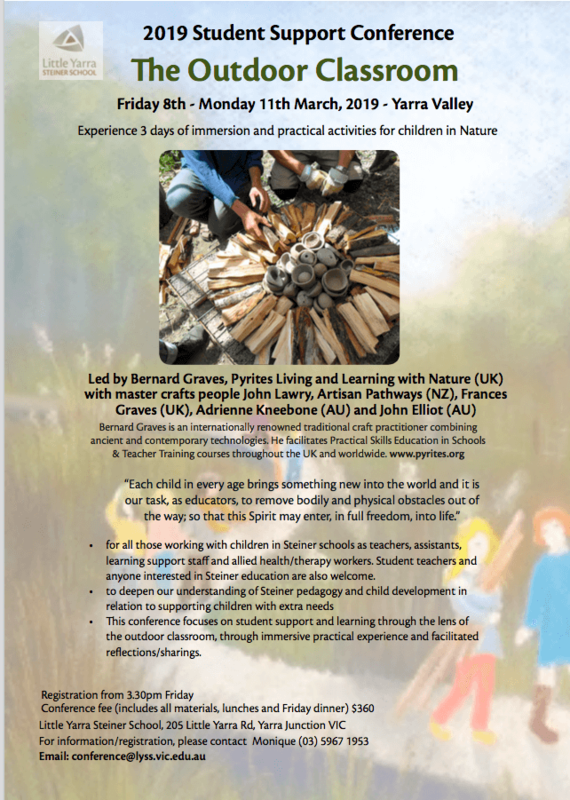 Suitable for therapists, learning support staff, teachers and parents. The therapeutic singing workshop is based on the ‘School of Uncovering the Voice’, developed by Valborg Werbeck-Svardstrom in collaboration with Rudolf Steiner. This is a very special event & we are bringing Stefanie Aurig from Germany to facilitate this experience in Melbourne & Perth. Stefanie is a singer, therapeutic singing practitioner & Anthroposophical music therapist, who also facilitates trainings in Germany & Brazil. Therapeutic singing is gentle & meditative, deeply powerful & capable of addressing all aspects of the human being as described by Rudolf Steiner. Working with the voice therapeutically can also develop the singing voice. The workshop in January is an incredibly exciting opportunity & will potentially interest anyone … All teachers, therapists, medical practitioners & the general Anthroposophical community … There’s also a great early bird rate before 1st December ! It’s also important to note that numbers will be limited to ensure that everyone has the best possible experience, so I would encourage registering as soon as possible to avoid disappointment. At the Melbourne Therapy Centre, Garden Room, 221 Wonga rd, Warranwood, Victoria 3134. Open to Naturopaths, Homoeopaths, Doctors, Nurses, Therapists and Teachers. Dr Matthias Girke returns to the Southern Hemisphere in February 2019 to lead our next Oceania Medical Section conference. The conference will have a new theme based format and be shorter than the traditional IPMT week. We welcome those with a background in anthroposophic medicine and therapy as well as those interested in what the anthroposophic approach has to offer their medical and therapeutic work. The evening lectures will be open to the public as in previous years. The conference will be held at Victoria University Wellington with accommodation and meals at the Te Puni Village hostel next door to our classrooms. Victoria University’s Kelburn campus is a short walk from central Wellington and easily accessible from the airport and bus/train station. The flyer is in process and will be posted shortly with the registration form. We are looking forward to seeing you in February. Interest in anthroposophic medicine is increasing in the European Union and around the world. In response, the IVAA is expanding the scope of its secretariat in Brussels with the aim of further elevating awareness and integration of anthroposophic medicine into EU health systems and beyond. IVAA’s new Exectutive Secretary, Elisa Baldini, will be leading this effort. Additionally, to strengthen this effort, IVAA just launched its new website. Enjoy!